So I thought I’d tell you a little bit about a program that I involved with, called the Youth Goodwill Ambassador. Basically, there are 37 students (myself included) from 24 different countries, selected out of an applicant pool of about 100+ students that have been awarded the title, Copenhagen Youth Goodwill Ambassador. The project is designed to create a network of international students that will promote Denmark and build global relations. Copenhagen Youth Goodwill Ambassador Corps is founded by Copenhagen Goodwill Ambassador Corps in partnership with the Danish Agency for International Education. 1. Support the global branding of Copenhagen and Denmark as a internationally renowned nation of knowledge and education. 2. To become exposed to and work with academic institutions, the business world, government entities and student organizations. 3. To refine or build our talents as future professionals of the global world. On the Culture Day and Social Night, we had a LONG tour throughout almost most of the Copenhagen Center. We met at the Danish Architecture Center, learned about the Copenhagen X project (Check out this link for more info: <http://bit.ly/7U4J15>), went to the Royal Danish playhouse and many other historical sites! We finished off the night with an eloquent dinner and drinks in the Meat Packing Districts. The Folketinget tour and meeting with Margrethe Vestager was such an interesting experience. Basically her take home message was that democracy is VERY important to the Danes and is STRONGLY based on consensus making and shared power. Even the kings throughout Danish history did not possess political power that would overrule the democratic ideals of Danish society. Also, the political atmosphere is designed to be informal and sort of laid back. The offices have a very cozy feel to them, not at all as formal looking as the U.S. Government offices. However, in the debates they usually address each other in the third person as a way to not seem like they are attacking the party’s political beliefs. She basically said that Denmark has such low corruption because of its openness. We finished off with a Q&A about our own questions for her. Of course, because of my interest in immigration and integration, I took the liberty to ask about, “What does it mean for an immigrant to be integrated into Danish society?” and “Would the Danish People’s Party proposal for a total freeze on welfare benefits to immigrants for their first seven years in Denmark, ever pass? and “Is such a proposal a reflection of Danish society?” Overall, her reply seemed to be based on the premise that, the Danish Social Liberal Party definitely seems to be an advocate for a Danish society with multicultural aspects. She finished off mentioning the stats that there are ONLY 6.8% immigrants in Denmark. This strongly led me to believe that her political party more or less doesn’t think immigration/integration policies are as important in light of other Danish hot topics such as strengthening the labor market and improving education. I will explain the other events as they occur. So far, I have been really enjoying this program and I have gained a lot of insight about Denmark that has definitely made me appreciate the different aspects of Danish society. A snail depicting the Danish law process. This week I’ve attended lots of talks and seminars that I thought I’d share with you all. On Tuesday I went to a talk by Denmark’s first female rabbi, Wednesday I went to a VERY enlightening talk about the international job market, and today (Thursday) I went to a program discussing the University of Copenhagen challenges with making itself more international friendly (something I complained about in my blog about my living arrangements and classes). I really enjoyed her talk about her many identities. I love learning about different belief systems and this was the perfect format to do so. Basically it was about 10 people and the rabbi explained her multiple identities. It was so interesting because she gave a very simplified explanation of Judaism, differentiating between Orthodox and Progressive Jews. Within Denmark, she explained that religion is very private and subdued, because even though Church and State are not separate, Denmark is still a relatively secular country. She also talked about the “gender inequality” within Judaism and how becoming a rabbi is almost unheard of in the Jewish religion. In her discussion of identity, she described herself as a rabbi (having both academic and vocational/pastoral duties), a Danish Jew (having to go abroad to become a Rabbi and essentially being an other in London as a person of Danish descent), being a female in a mostly male-dominated religious position, among other aspects of herself. She identifies herself as a Progressive Jew as it has allowed her to create her own niche within Judaism. Another highlight of her talk was her response to my question about the religious vs spirituality distinction and rational vs. mystical interpretations of Christianity in the United States. She was just so structured in her thinking. She basically said that you are a Christian when you confess Jesus Christ as the Messiah but Judaism is not based on faith, most people usually discuss if there is one dogma or one God. So Judaism is about acting and not just believing. She was a very critical of the spiritual distinction in Christianity, saying that sometimes people mistake their emotions for spirituality and often forget the acting part. It’s okay to believe but are you acting on what you believe and not just believing on what you believe. Overall, I liked how she said that she can’t talk about the religion as a whole but she can only talk about her views of Judaism. So it’s really just her perspective and I respect her for saying that. I very much looked forward to this discussion panel. It was a discussion panel of 5 people, 4 Americans and 1 Danish person, all discussing how they entered into the International Labor Market. I won’t go into too much detail but I will highlight some of the advice that they gave. Never count yourself short. Make yourself indispensable. Know yourself! This basically means have some idea of what you want to do. Never settle for anything less. Be opportunistic and don’t be afraid to take something that will be used as a means to get you to the place you want to reach. See opportunities beyond obstacles. Figure out the location of where you want to live and think of integration factors: Obtaining visas and how much can being in that particular location help you develop into what you want to be. Do a job because you want to, not because you have to. Keep in mind that making the transition between going to school and getting a professional job is always challenging! Network as much as possible. One panelist said that possibly 66% of job opportunities in Denmark are obtained through networking or informal means! This was basically a program designed to discuss what Copenhagen has to offer students in the Faculty of Health Sciences and Medical Field. They also addressed international student integration issues. I definitely have my problems with KU but I will address them with time. I think one of the main problems is the lack of transparency. You are expected to know things about KU that aren’t so obvious UNLESS you are Danish. For example, some of the websites with important information haven’t even been translated in English yet or sometime emails with class information are sent around in Danish. Thank God for Google Translate, but it can still be a bit tedious and sometimes can even create this feeling that you aren’t fully accepted. Practical matters such as how to gain access to library databases or what are research paper guidelines, just are not that clear and made known to international students. Also, there is a level of disconnect between lecturers and administrative staff. But every school has its issues and you learn to deal. All of the difficult stuff I have had to navigate has made me appreciate my studies even more. If you study here you really have to learn to take the initiative and ask as many questions as possible. As I said earlier, KU is in a transitional stage for internationalizing the university, it might take some time but they will eventually get there. October 15th was Culture Night! Culture Night is a night where over 200 museums, churches, exhibition halls, galleries, political institutions, and other venues all over the city stay open relatively late, exposing the world to the broad cultural landscape of Copenhagen. When I went to Culture Night, two years ago, I felt like I went to see more of the tourist attractions but I didn’t feel like I really got a deeper appreciation for Danish culture. So this time around I went with one of my Danish roommates. We spent most of Friday morning, planning out all the places we wanted to go. After we compiled our list, we decided that it might be best to just stay in the Copenhagen City Center since we’d be walking all night. This time was different because I was able to experience aspects of Danish culture with an actual Dane. First, we decided to attend the Danish Templar Knights tour. This is something I would have NEVER thought of attending. The whole tour was in Danish, so my Danish roommate just translated what the speaker was saying. Basically it is a “secret society” (in Denmark, mostly men but in Sweden and Norway, women are able to become Templar Knights) of older men 40+ that decide to reflect on their life and develop philosophical and spiritual answers to some of life’s biggest problems. I was fascinated by the idea of this, because it had this very old and early Christian period feel to it but within a modern context. It was like a step back into a past way of living. I also liked it because of my background in philosophy. As stated by Socrates, “an unexamined life is not worth living. After that we ventured around the City Center to see some other sites that you would never get the chance to see. I really wanted to go and see the Danish prison but the line was so long I would have missed everything else that night! So we decided to check out the Round Tower but weren’t able to get to the top because of the long waiting line. However, we did get a chance to check out the beautiful church in the Round Tower. I swear the churches here are so beautiful you almost don’t want to go inside of them. Next, we went to the Haunted House, located at the Old Firehouse on Skindergade, in which we were given the task to find 6 plates which were hidden throughout the house. It was mildly scary, but I enjoyed it. After lots of walking around and discovering that all the free food places that we had on our list only had appetizer quality dishes, we decided to eat what my Danish roommate described to me as a very traditional Danish sandwich, grilled pork with beet root and white bread. All I can say was that it was AMAZING. Then we made our way to the Botanical Garden, where there was this big concert going on. I would have preferred to go to more parts of the Botanical Garden, as I didn’t care too much for the concert music. Of course, b/c of my fascination with taking pictures of flowers I managed to get some pictures of the carnivorous plants! After that we wanted to check out the ruins under the Christiansborg Palace, but somehow ended up playing Wildlife Jenga. So basically this guy had set up a Jenga with huge blocks and each block represented different species/ecosystems of the Earth. For example, he had a rainforest block, beaver block, and many other species of animals. After each block was removed he would say that species isn’t important for the survival of the Earth. It was a rather entertaining idea to think about. We stayed there until someone removed a block and eventually the block tower fell down. We finally made our way to the ruins and I received a lesson on the history of Copenhagen, which involved A LOT of fires and reconstruction. After looking around the underground ruins, we visited the Folketinget, where all the political parties are housed at. It is one huge building with state of the art architecture. I really wish I could understand Danish so I can sit in on one of the public debates. Lastly, we went to check out a Gregorian chant concert where we actually took Communion. It was a very unique experience taking Communion at midnight in a very Lutheran style. Since the church was dark everyone in the congregation had candle lights, which was amusing to watch as people walked outside with candelights. Actually, as my roommate and I walked down the street, singing “This Little Light of Mine”, someone asked us if we were marching for Jesus! To end off a night of walking WAY more than 5 miles around the Copenhagen City Center, my roommate and I finished the night off with some white wine at a low-key bar by the apartment. As usual, you can expect a deep discussion with Danes at ANY time of the day. We had a very good discussion about religion and spirituality, and then what coming back to Copenhagen the second time meant to me. Overall, Culture Night was different from my experience two years ago because I was able to experience some aspects of Copenhagen that are so revealing of what it means to embody Danish culture. I know I might sound like a broken record with my desire to understand Danish culture, but you really have to make yourself open to things that you wouldn’t normally think of doing. I would have never really wanted to learn about Templar Knights and might have shied away from the whole idea. My point is to say that partying in Copenhagen can be fun, but having a nice chill night getting to connect with the country’s culture is also very important. Now I have a list of purely cultural opportunities that I will visit throughout my year here. If you’re in a country for a significant amount of time, find a balance of what you do for your nights out and you’ll get so much more out of your abroad experience. Round Tower Church Pipes for the Organ! This is a picture of the church inside of the Round Tower. So far I really like biking around Copenhagen. It is such a nice change from relying on the bus. I can leave when I want to leave and set my own schedule. One thing I must admit, biking during rush hour can be very challenging. There is so much construction going on in the Copenhagen City Center, particularly on my route to and from school. So sometimes it can get a bit congested and everyone is just as different experience levels. Today, one man just stopped abruptly while there were a long line of bikers RIGHT behind me. I think my life flashed before my eyes. Luckily I reacted fast and stopped without causing the other bikers to crash into me. Oh well, it just helps me get a better feel for what to watch out for when I’m biking. Always be cautious of the person riding their bike in front of you. Just like driving, try not to drive up too close on the back of the person. I like to have at least a bike length in front of me. This is just in case someone stops too fast, you’ll then have enough room to react appropriately. Watch out for people that just walk in front of you WHILE you are biking. They always think they will make it across the biker path before you ride by. This is not always the case. During rush hour people will be riding really fast, don’t let the biker rush make you ride your bike faster than you would like. The right lane is like a slow lane, so stay in that and ride the pace you want to ride. If someone wants to pass you, then they’ll just ride in the left lane and pass you. I usually end up riding slowly in rush hour because it’s usually really congested. Always error on the side of caution. Even if you think someone isn’t behind you, always use the appropriate hand signals. Raise your hand if you are going to stop, try to do it at least 5-10m before you are going to stop. If you are going to turn, you put your hand out to the respective side that you are going to turn. It’s as simple as that. One thing you’ll find in Copenhagen, are a LOT of bikes. 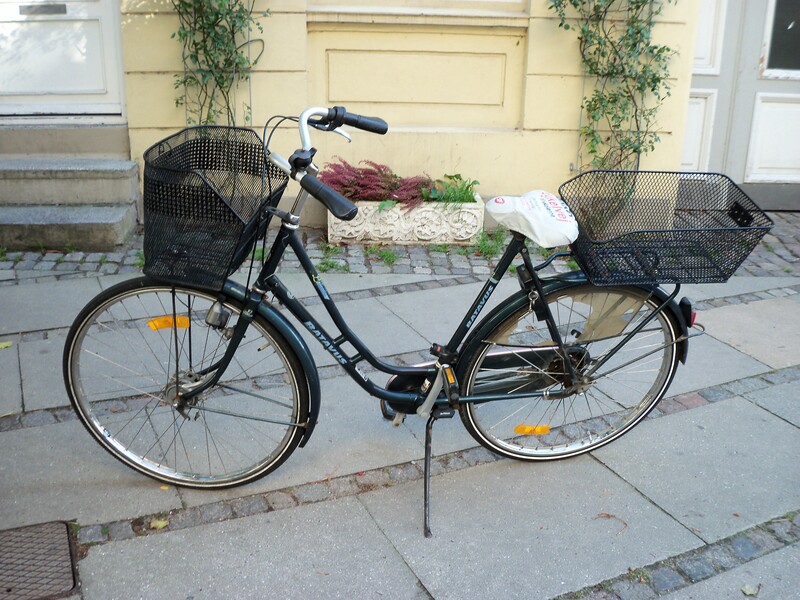 I would go as far as to say you aren’t “fully Danish” until you own a bike. Well yesterday I entered onto the path of becoming a Dane by purchasing a bike. It almost felt like I was buying my first car, as I even got the chance to take it for a test-drive! Luckily it was only 600DKK which is about 110USD. That is REALLY cheap for a bike compared to the amount that most people tend to pay for a good quality bike (this can range from 200USD to sometimes 1,500USD). My bike is blue with a basket in the front and the back. I even got the change to bike all the way from where I purchased the bike to my apartment, which was about a 2km bike ride. 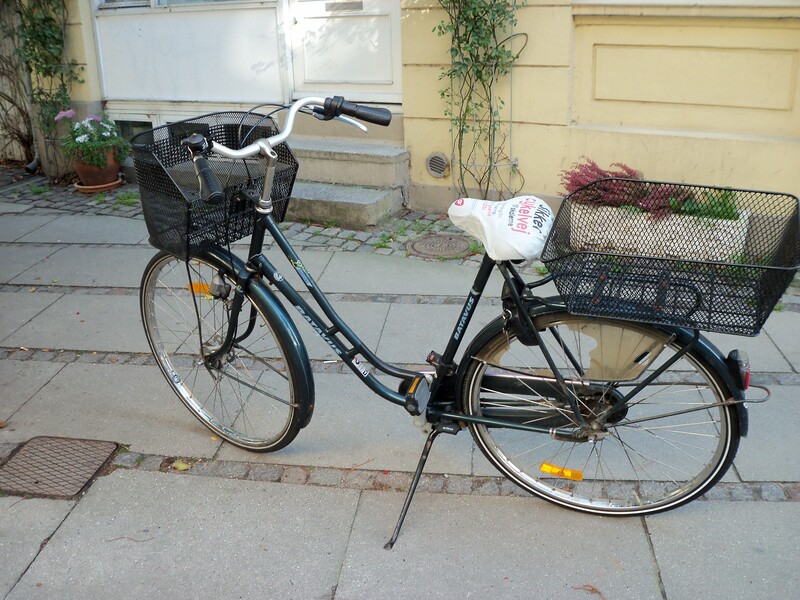 I must admit I am kind of terrified of biking in Copenhagen. Here it’s one of their major modes of transportation, so bikers even have their own lanes and traffic lights. You even have to have a bike light for riding at night and you use your hands as signals for when you want to stop or when you want to turn. Also, you have a bell that signals for people to move out of your way or that you won’t be stopping for the unlucky person in your path. Whenever I hear a biker’s bell my life sort of flashes before my eyes.